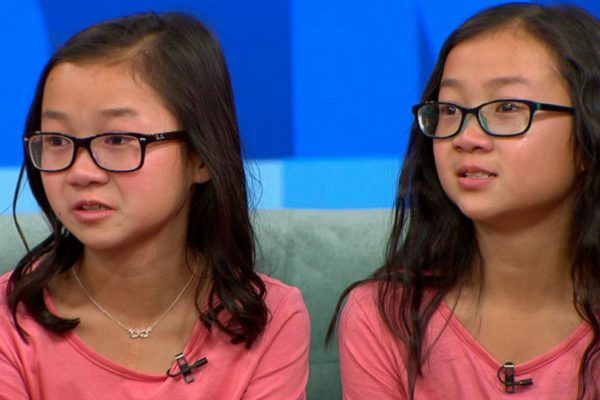 TV program Good Morning America delighted millions of viewers when they brought 10-year-old twins who were separated at birth back together again, live on the program. Audrey Doering of Wisconsin and Gracie Rainsberry of Washington haven’t been together since they were born, that was until are GMA facilitated their on-air reunion yesterday in a total feel-good bonanza. While some might question the wisdom of publicising an obviously intimate moment – and exposing these kids’ emotional lives to the world – there’s no denying most viewers loved being in on the act. The girls had already ‘met’ virtually in December, via Facetime, chatting and playing online games together, but the GMA appearance was their first meeting in real life. Their story begins when they were abandoned as newborn babies. They were both put into foster care and then adopted out to different homes in 2007, aged 15-months, as part of a Chinese adoption program. Gracie and Audrey both had congenital heart conditions and would later separately undergo corrective heart surgeries in the US. Neither of the adoptive families were told their new baby was a twin, and it’s thought that the twins had been separated because they were both classified as having “special needs” and would have a better chance of adoption as individuals. Last year, Audrey’s mum, Jennifer, was delving into her daughter’s history, with the help of a researcher. The researcher stumbled across a photo of Audrey with her foster mother – and another identical baby in the frame too. Jennifer could not believe her eyes. “As soon as I had that picture, I was desperate to find out who that other child was,” Jennifer explained. Eventually Jennifer tracked down the other child – Gracie – and her mum and dad (the Rainsberrys) via some pretty extensive Facebook sleuthing. She then sent the Rainsberrys a copy of the photo the researcher had found, and the families began to put the pieces together more cohesively, all the while with jaws dropping and excited disbelief. They organised a DNA test and confirmed 100% that the girls were indeed sisters and twins. Amazing! Then they told the girls the news. Eek! “I started to talk to her, and ask questions.” Audrey told USA Today. “It’s like talking to me. The girls are both in fifth grade, both love sport, maths and ponytails, but that’s not all. “She has the same type of glasses as me, except mine are actually broken and hers are teal and mine are pink,” Audrey reports. “We both love Chicken Alfredo. That’s like one of our favourite foods,” Gracie said, confirming the twin-seal-of-authenticity. It seems that the the girls were not the only ones twinning, with their families’ stories also mirroring one another, from different parts of the country. Jennifer and husband Thomas were already parents to three boys when they adopted tiny Audrey. Nicole and Scott Rainsberry also wanted a fourth child, choosing adoption to grow their family. Both families were also happy to adopt a child with special needs. The families appeared on Good Morning America for the big reveal, and when the screen between Audrey and Gracie slid back, the pair (dressed almost identically) hugged each other and cried. Yay! We’re so glad that these girls finally got to meet one another, in real life. We’re not sold on the game-show-style public nature of the reunion, but it’s clear that despite 10 years of separation, the bond is strong between these kiddos. They most definitely have a bright future, joint family holidays (and many bowls of sisterly mac and cheese) ahead.